Make Beaded Panels, decorative grooves, and molding! 2 flute, carbide tipped. Will plunge cut. 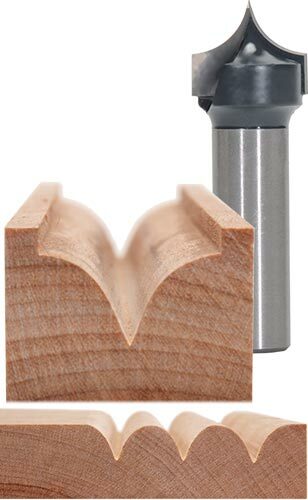 For carving decorative grooves and edge forming. With multiple passes, beautiful moldings and raised panels can be created. 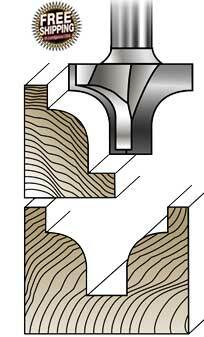 The Point Cutting Round Over bit was used to make Beaded Panels in Woodsmith #146, Vol. 125. The article states: "By routing two grooves side by side, you can get a nice bead pattern". See the Bead Board Instructional Video. Our new Faux Raised Panel bit is actually a groove forming bit that simulates the look (in a cost effective way!) of a raised panel on a solid door. Make signs or simulate a "raised panel" look on doors. 2 flute, carbide tipped. Great for sign making as well as creating a raised panel look on solid doors. Simple adjustments to the cutting depths will give you a variety of effects. Should do a great job. Great for making bead board panels. 2 flute, carbide tipped. Make beaded panels for any project. by routing side by side grooves. Click on the tab above to view the video or on the link below to view an instruction sheet. I used a 1/8" rad bit to bead some red oak. I tested the bit in some pine and it made perfect beads. It made perfect beads in the red oak also however there was a bit of tearout at the point. I used a 1/2" chisel as a scrapper to clean it out. I finally touched it up with a 1/8" radius hand sander. Looks beautiful. This bit does a nice job of making beaded panels. You must carefully control the depth and spacing, I used a router table with an Incra jig. I give it 3 stars because after 10 panels (150 feet of cuts) in MDF the bit was dull and useless. It is to small to sharpen. So, if you are using this bit for MDF or other hard to rout materials, you may need several.